Released in 2009, The Hangover was nominated for many awards, winning almost half of them including the Golden Globe Award for Best Motion Picture – Musical or Comedy in 2010. The film was such a success that two sequels, The Hangover Part II and The Hangover Part III, were later filmed and released. Much of The Hangover was filmed in Nevada. Here’s a rundown of 10 filming locations along with a few fun facts you might not know about The Hangover. The Jean Fuel West Shell was renamed “gas n gulp” for the movie. Filming also took place inside the Food Mart with a few changes made to the interior. “The Villa” is not a real suite available at Caesars Palace. The room was designed and created on Stage 15 at Warner Bros. Studios, with inspiration drawn from The Forum Tower Emperor’s Suite (which is actually the suite featured in the movie Rain Man). 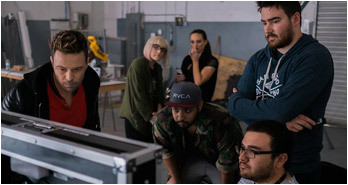 Why did they choose to create the set instead of using a real room? Because they didn’t want to damage real property… and because tigers aren’t allowed in hotel rooms. Although the suite that the guys stayed in doesn’t really exist, the hallway and elevator lobby the guys were at throughout the movie is real and located on the 24th floor of the Augustus Tower. Did you know that baby Tyler (aka “Carlos”) was actually played by three sets of twins and a dummy? The Best Little Chapel is not a real place. A fake building front was added to the northern side of the Hostel Cat building. The bus stop that the guys drove through is also fake and was added for the movie. Lindsay Lohan was offered the part of Jade but she turned it down. She later admitted that she regretted that decision. It was actually Ken Jeong’s idea to jump out of the trunk of the car naked. 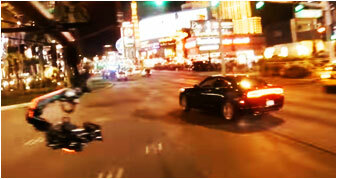 In this scene filmed at East Fremont St, Phil, Stu and Alan are on their way to return Mike Tyson’s tiger. In real life, Mike Tyson actually owns 7 tigers! Atomic Liquors is the oldest free-standing bar in Las Vegas. This whole scene is an homage to another locally filmed movie, Rain Man. If you’re a huge fan of the movie and are here in Las Vegas, you should definitely think about taking your own little film tour of all of these filming locations for The Hangover! Send us pictures of you visiting these movie locations from your favorite scenes and we’ll share it on our Facebook and Twitter! 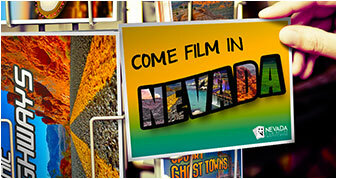 For addresses and exact locations used throughout The Hangover, check out our interactive Nevada Film Tourism Map! The information contained in this article is deemed to be accurate and true to the best of our knowledge. If there are any inaccuracies, you may submit corrections and sources by visiting our Contact page.